FULL REPORT (1.4 MB, PDF file): Sixth Amendment Center, The Right to Counsel in Utah: An Assessment of Trial-Level Indigent Defense Services (October 2015). EXECUTIVE SUMMARY ONLY (630 KB, PDF file): Sixth Amendment Center, The Right to Counsel in Utah: An Assessment of Trial-Level Indigent Defense Services (October 2015). Utah’s trial courts do not uniformly provide counsel at all critical stages of criminal cases as required by the U.S. Supreme Court, with many defendants – particularly those facing misdemeanor charges in justice courts – never speaking to an attorney. Those defendants that do receive representation too often receive an attorney operating under multiple financial (and other) conflicts of interest arising from unfair contractual arrangements that disincentivize zealous representation. The challenge of providing effective representation for each client can be exacerbated by excessive caseloads that reduce the time a lawyer can spend on an individual case. And these appointed attorneys generally lack appropriate independence from undue state and local government interference in securing the necessary resources to put the state’s case to the test. The primary cause for the institutionalization of these practices is the lack of accountability inherent in the system. These are the Sixth Amendment Center’s findings from a statewide evaluation of right to counsel services in Utah. 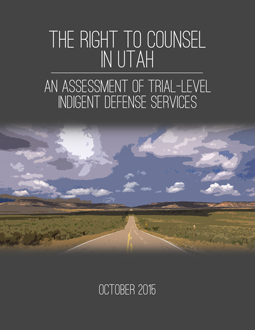 The 6AC’s report documenting these deficiencies, The Right to Counsel in Utah: An Assessment of Trial-Level Indigent Defense Services, released on October 26, 2015, was the culmination of a year-long study, funded by a U.S. Department of Justice, Bureau of Justice Assistance grant, and conducted in partnership with the Defender Initiative of Seattle University School of Law. Utah is one of just two states requiring local governments to fund and administer all indigent defense services. Though it is not believed to be unconstitutional for a state to delegate its constitutional responsibilities to its counties and cities, the state must guarantee that local governments are not only capable of providing adequate representation, but that they are in fact doing so. The state of Utah, however, has limited capacity and no institutional presence to assess whether its constitutional obligations under the Sixth and Fourteenth Amendments are being met at the local level. The lack of oversight and accountability from the state on down to the local communities allows the significant structural flaws detailed in our report to linger uncorrected. The state’s failure to monitor compliance with minimum constitutional demands has institutionalized the acceptance across the state that thousands of defendants face criminal charges without the assistance of counsel. Where defendants are provided with attorneys, the prevalence of deep-rooted systemic conflicts of interest are still embedded as part of the very fabric of the right to counsel in Utah. Future attempts to remedy such systemic conflicts cannot succeed without first addressing the lack of constitutionally-mandated defender independence. This is especially true in Utah, because many county and local governments place right to counsel services under the auspices of the prosecution function. Even where the prosecution has been removed from providing oversight, however, no indigent defense system is sufficiently insulated from political or judicial interference. As a result, governments across the state, even in Salt Lake County, interfere with the rendering of effective defense representation. Although our report documents significant hurdles preventing the state from meeting its minimum constitutional right to counsel obligations, we are confident Utah can and will remedy these issues in a way that makes sense for its citizens. The Sixth Amendment Center remains committed to assisting the state of Utah as policymakers and criminal justice system stakeholders seek solutions to the problems identified in our report. The Right to Counsel in Utah: An Assessment of Trial-Level Indigent Defense Services (October 2015), is available from the Sixth Amendment Center in electronic format only.